A Texas couple dreamed of a home in the rolling hills of Santa Fe that showcased their spectacular art collection. Erinn Morgan finds a minimalist masterpiece of glass and light. A structural glass wall — the first of its kind in North America — is the only support for the Klein home’s cantilevered roof. Photo by Frank Oudeman. Jeanne and Michael Klein instantly loved the rugged Santa Fe hillside that would one day incorporate their second home — and a celebration of both art and nature. “This land was appealing to us because you could see the changing colors of the dramatic New Mexico sky to the west and also view the high alpine mountains to the east,” says Jeanne. In addition, the 20-acre space backed right up to the Santa Fe National Forest. The Kleins’ art collection includes pieces by contemporary and minimalist masters Ellsworth Kelly, Kiki Smith, Richard Serra and Donald Judd. “We didn’t want to build a separate structure for the art. We wanted to walk through it every day — all day,” says Jeanne. Concrete provides a soft, textured backdrop for the Kleins’ art. Photo by Frank Oudeman. 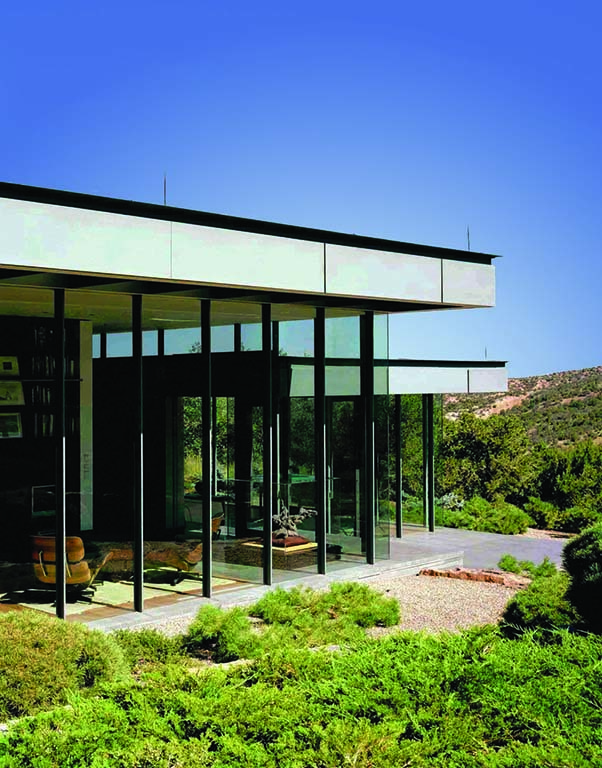 Since the 8,000-square-foot Klein home was built just outside Santa Fe 10 years ago, it has been acclaimed as among the finest American homes built for art. One of the centerpieces is an Ellsworth Kelly sculpture around which the living room was designed. Another key piece: a James Turrell Skyspace, embedded into the center of the house. It offers a contemplative space in which to experience the ever-changing Southwest sky. Ensuring the perfect placement for the home’s vital art pieces, the Kleins and DuBois, of New York City-based Ohlhausen DuBois Architects, positioned the art before the house was even designed. Then DuBois created huge hallways where the art is placed. These linear spaces are juxtaposed against big, open living areas accented by glass walls. 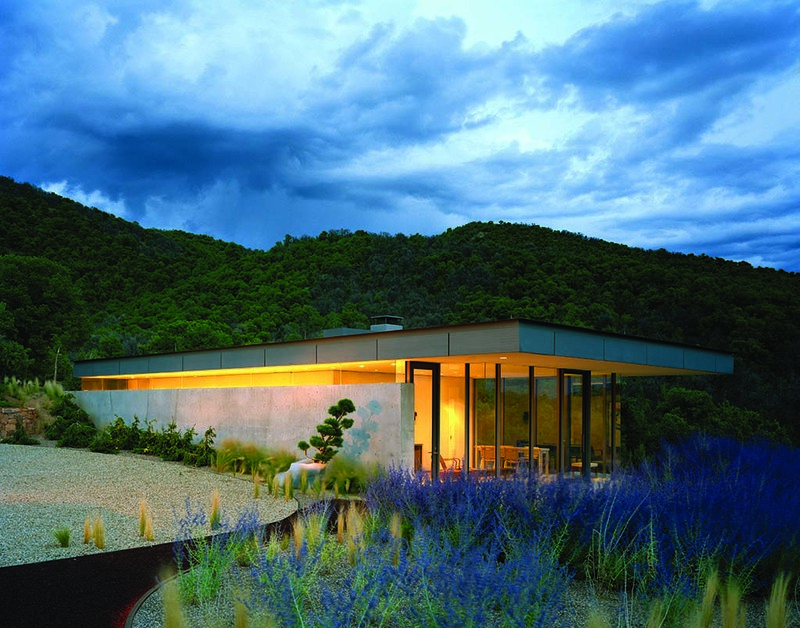 Clean lines and glass allow the New Mexico landscape to take center stage. Photo by Frank Oudeman. The Klein home uses a simple, elegant materials palette of concrete, basalt, zinc, walnut — and lots of glass. 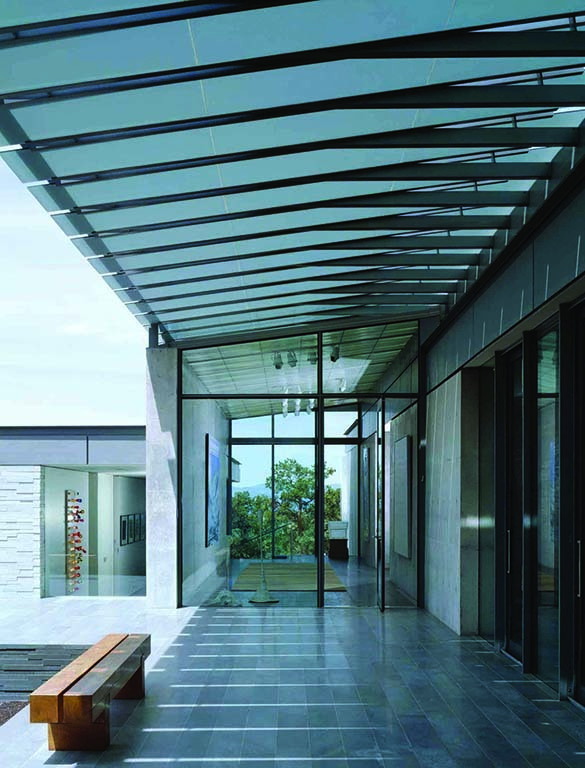 A unique structural glass wall that passes through the center of the home is the only support for the structure’s cantilevered roof. According to DuBois, this utilization of structural glass is the first of its kind in North America. From design to completion, this home project took more than 3 years. DuBois notes that the design went fairly quickly, but the implementation of the structural glass wall added time to the schedule. 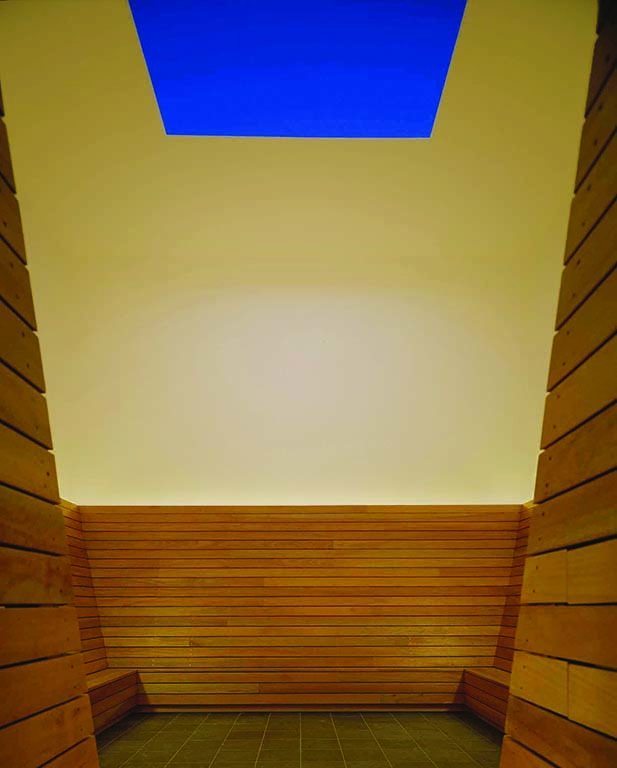 A James Turrell Skyspace offers a spot to contemplate the changing Southwestern sky. Photo by David Marlow. 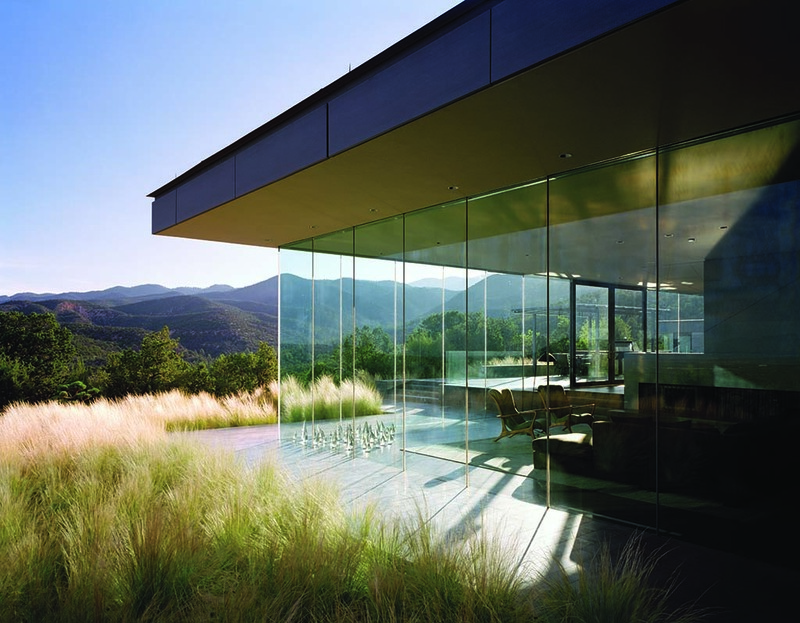 An engineering success, the Klein home’s sheer walls of glass ultimately fuse the indoors with the outdoors, realizing their goal of living in the natural setting. “As you sit there you get this gorgeous view of the mountains and you get to see the changing colors and storms coming in — it’s just so beautiful to be able to experience this glass,” says Jeanne. Designers used an elegant palette of basalt, zinc and walnut throughout the home. Photo by Frank Oudeman. A sunshade runs the length of the house, softening sunlight and creating a modern shaded porch. Photo by David Marlow. Specially designed trails, colorful plantings and outdoor art installations lead to the guesthouse. Photo by Frank Oudeman.